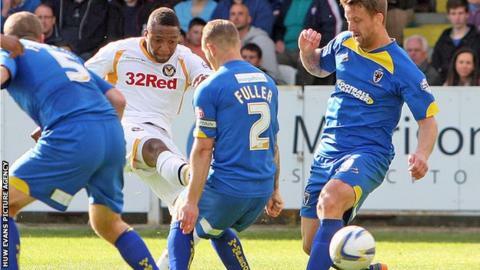 AFC Wimbledon came back from two goals down to secure a point at home to Newport County in League Two. Chris Zebroski's spectacular volley gave Newport the lead before Michael Flynn doubled the lead from the penalty spot after Christian Jolley was fouled. Kwesi Appiah reduced the deficit after Newport failed to clear a free-kick. George Francomb equalised for the hosts when his long-range effort took a deflection to beat Ian McLoughlin. Newport County striker Aaron O'Connor came on as a second-half substitute to make his first appearance of the season after a lengthy injury lay-off. "I'm bitterly disappointed. I thought we were as good as we've been for a long while in the first half. "From going 2-0 up we should have gone on to win the game comfortably. "We've then put ourselves under pressure and allowed Wimbledon a big lift in the game which they hadn't worked hard for." Match ends, AFC Wimbledon 2, Newport County 2. Second Half ends, AFC Wimbledon 2, Newport County 2. Andy Sandell (Newport County) is shown the yellow card. Jack Midson (AFC Wimbledon) wins a free kick in the defensive half. Foul by Andy Sandell (Newport County). Attempt missed. Robbie Willmott (Newport County) right footed shot from outside the box is close, but misses to the right. Foul by Aaron Morris (AFC Wimbledon). Aaron O'Connor (Newport County) wins a free kick in the attacking half. Substitution, AFC Wimbledon. Luke Moore replaces George Francomb. Danny Hylton (AFC Wimbledon) wins a free kick in the defensive half. Corner, Newport County. Conceded by Darren Jones. Attempt saved. Aaron O'Connor (Newport County) right footed shot from the centre of the box is saved in the bottom right corner. Attempt saved. Kwesi Appiah (AFC Wimbledon) header from the centre of the box is saved in the centre of the goal. Jack Midson (AFC Wimbledon) hits the right post with a right footed shot from the right side of the six yard box. Substitution, Newport County. Robbie Willmott replaces Christian Jolley. Substitution, Newport County. Adam Chapman replaces Michael Flynn. Foul by Andrew Frampton (AFC Wimbledon). Lee Minshull (Newport County) wins a free kick in the attacking half. Corner, AFC Wimbledon. Conceded by Christian Jolley. Lee Minshull (Newport County) wins a free kick on the right wing. Goal! AFC Wimbledon 2, Newport County 2. George Francomb (AFC Wimbledon) right footed shot from outside the box to the bottom left corner. Michael Flynn (Newport County) wins a free kick on the left wing. Kevin Feely (Newport County) is shown the yellow card. Attempt missed. Jack Midson (AFC Wimbledon) right footed shot from the right side of the box is close, but misses to the left. Foul by Danny Hylton (AFC Wimbledon). Substitution, Newport County. Aaron O'Connor replaces Rene Howe. Attempt missed. Kwesi Appiah (AFC Wimbledon) right footed shot from outside the box is close, but misses to the right. Attempt missed. Jack Midson (AFC Wimbledon) header from outside the box misses to the right.